【Compact Size and Light Weight】: 5.7*3.15*0.94 inches and 320g. As large as an iPhone 6 plus. Easily fits in your glovebox. 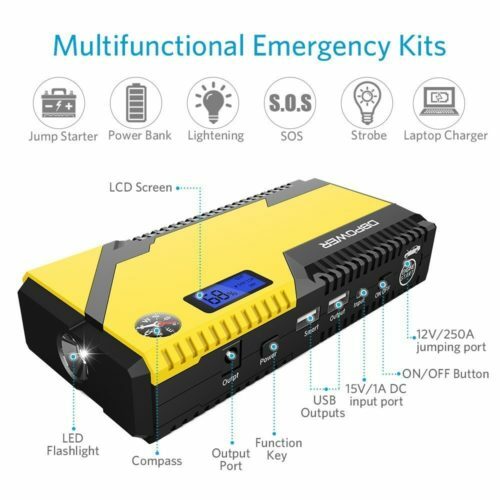 【Emergency Life Saver】: 500A peak current is able to jump start your vehicle (motorcycle, RV, tractor, light-duty trucks, cargo vans, ATVs, snowmobiles, oil boat, etc) up to 3.0L gas engine or 2.0L diesel engine. 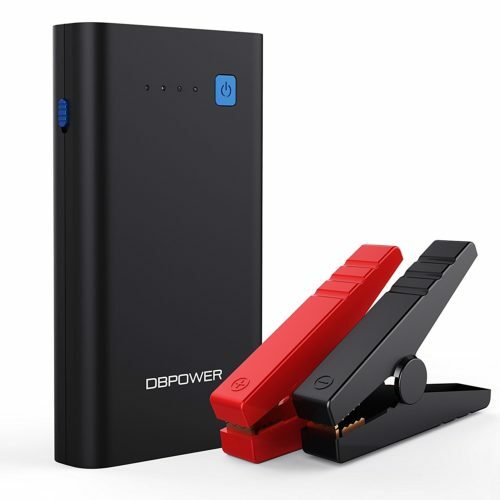 【Quick Charge 3.0】: Besides 10800mAh capacity and a normal 5V/2.1A USB output, this jump starter is also equipped with a quick charge 3.0 output, which can charge compatible devices 4 time faster than normal portable charger. 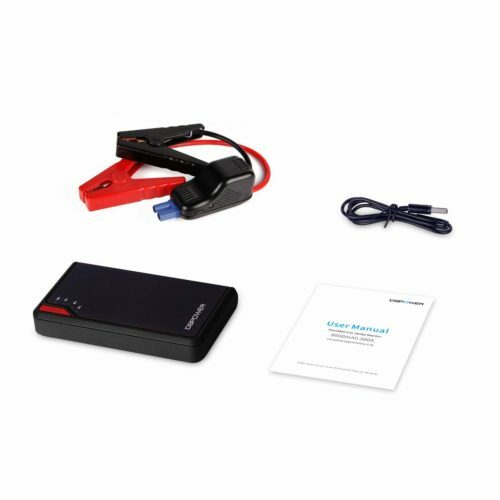 【USB Type C Port】: The jump starter comes with an advanced USB Type C input/output to be charged or charge other devices. 【Ultimate Safety Protection】: The high quality and spray gold clamps with a built-in protection circuit provides over-current protection, short circuit protection, over-load protection, over-voltage protection, over-charge protection. Provide ultimate protection for your safety. 【SUPERIOR PORTABILITY】Compact size (7.48x3.54x1.73 inches) and light weight (650g) for your convenience. 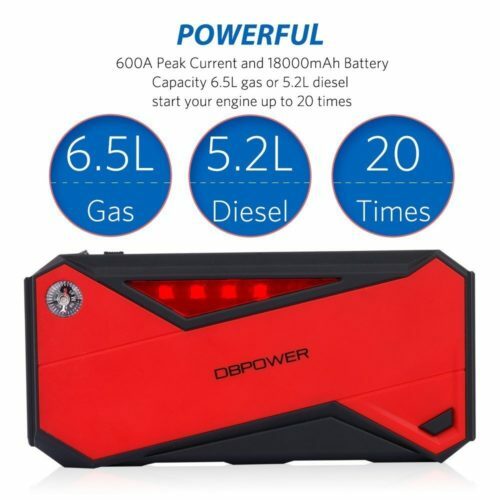 【POWERFUL JUMP STARTER】800A peak current and 18000mAh capacity ensure to start your vehicle up to 6.5L petrol engine or 5.5L diesel engine up to 20 times in a single charge. 【DUAL USB OUTPUTS】Dual USB outputs and 18000mAh battery capacity let you charge your cellphone, tablet, kindle, etc. whenever and wherever you like. 【MULTIFUNCTIONAL LED FLASHLIGHT & LCD SCREEN】The device is equipped with a three-mode (lightening, SOS, strobe) LED flashlight and a red emergency light for emergency use. The LCD screen exactly shows the device's working status. 【ULTIMATE SAFETY】The all-metal clamps with an intelligent protection circuit inside can provide anti-reverse protection, short-circuit protection, over-charge protection, over-discharge protection, over-heat protection, etc. Keep you away from danger. 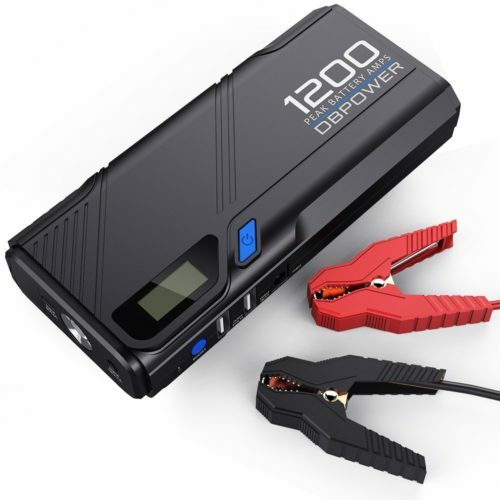 【POWERFUL】: At 1200 amp peak current, your DBPOWER device packs enough punch to be able to jump start all 12V battery vehicles up to 6.5L gas and 5.2L diesel engines. Also suitable for boats, lawn mowers and more! 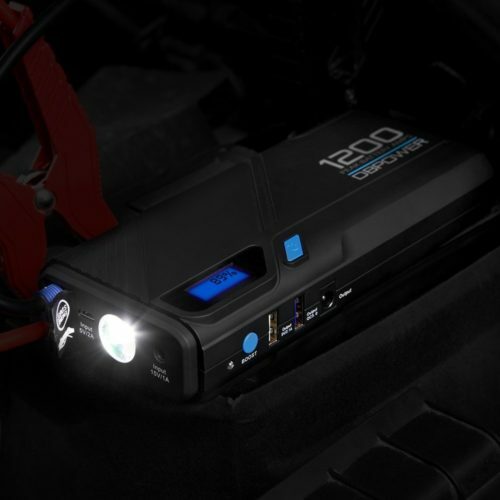 This powerful device is capable of jump starting a car 20 times when it’s fully charged! 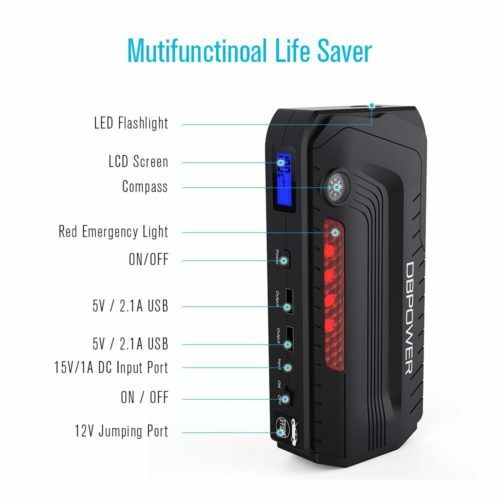 【SAFETY GUARANTEED】: Built-in intelligent security function with advanced highly quality jumper clamps, can protect the jump starter from over current, short circuit, overload, over-voltage, over-charge. 【SMART CHARGING PORT】: With the QC 3.0 USB port, it can full charge your smartphones, tablets, and other mobile devices at the fastest speed possible. 【COMPACT & LIGHTWEIGHT】: Mini Dimensions 7.1”x 3.2”x 1.4” with 2.4 pounds weight, portable and compact enough to store in your glovebox. 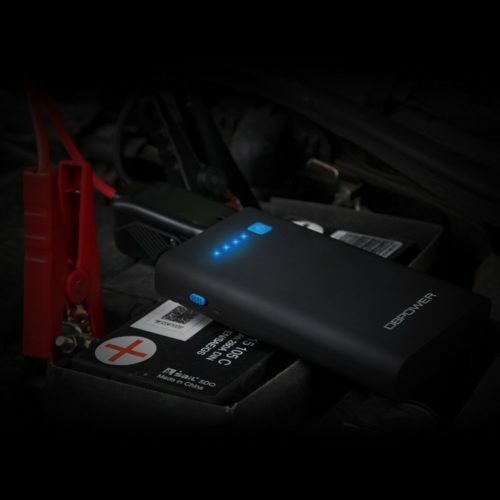 【MORE FUNCTION EVER】Unlike the traditional jump starter, it has additional function! 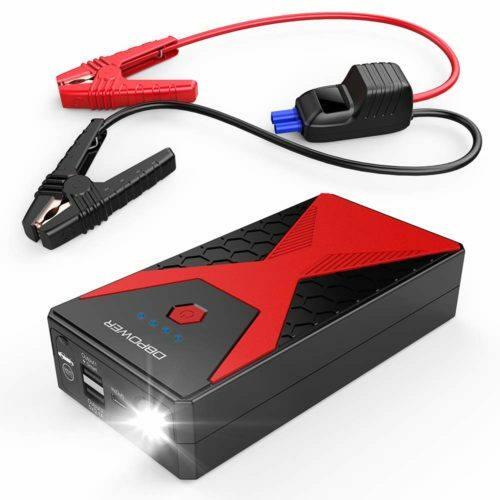 You can use it to charge vehicle's battery for less than 10 minutes through the cigarette charger , and then try to start your car inside. 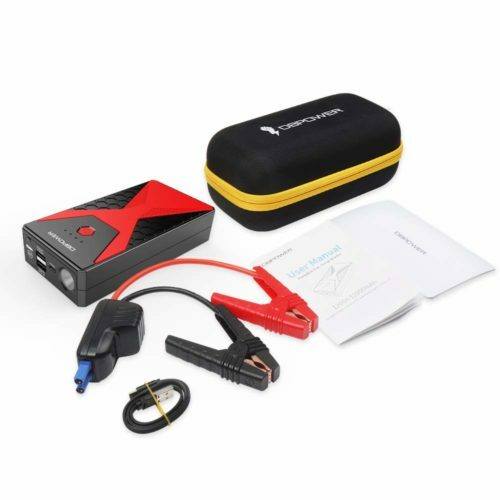 ULTRA COMPACT JUMP STARTER: Jump start your vehicle up to 2.5L gas engine up to 10 times with 300 amps of peak current and heavy duty clamps and cables. Compact enough to store in your glovebox. 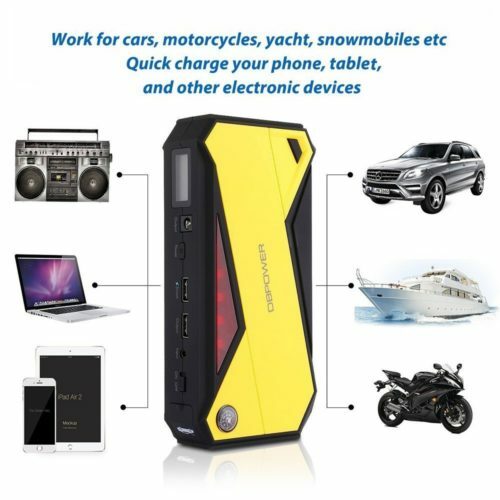 POWERFUL: With 8000mAh capacity, charge phones, tablets, kindles and other devices at speeds of up to 2.1 amps per port overall. Recharges in just 5 hours using the USB charger. LED FLASHLIGHT: Built-in flashlight with 3 modes (high, strobe and SOS), offers you more guarantee on the way. SAFETY PROTECTION: The intelligent jumper clamps has over current protection, short circuit protection, overload protection, over-voltage protection, over-charge protection. 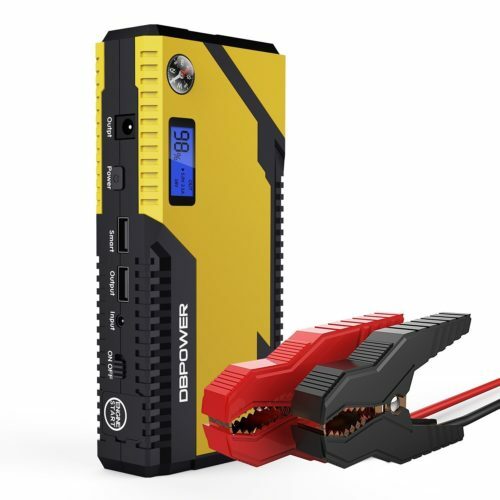 WHAT YOU GET: DBPOWER Jump Starter DJS40, intelligent jumper cables, Android USB cable (NO adapter, universal USB adapter compatible), welcome guide, our fan-favorite 3-year warranty and friendly customer service. 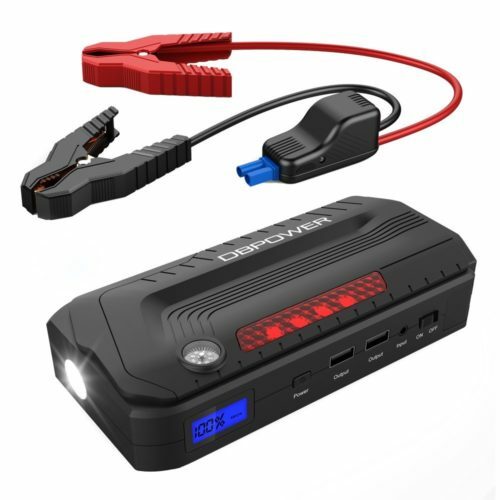 【SUPER PORTABILITY】Unlike some big & heavy jump starters, this one is small & light enough to store in the glove box. 7,28*3,46*1,38 inches, 1.35lb. 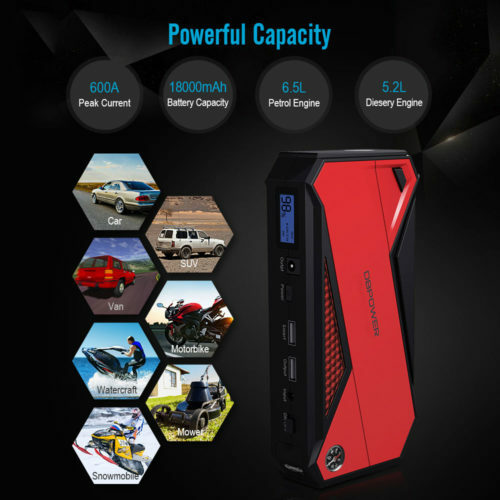 【Powerful Starting Capacity】:This jump starter can provide 1200A peak current to jump start various vehicles (motorcycle, RV, tractor, light-duty trucks, cargo vans, ATVs, snowmobiles, oil boat, etc.) up to 6.5L gas engine or 5.2L diesel engine. 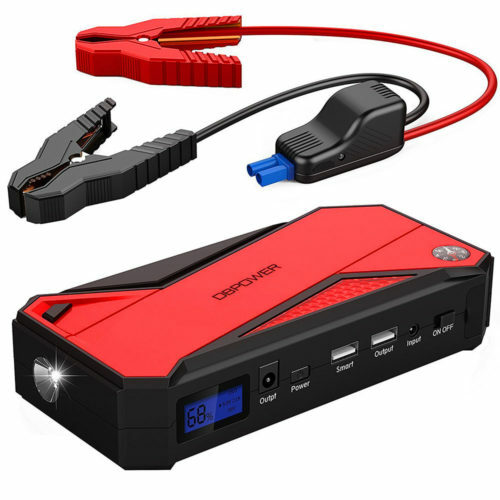 【Portable Charger Power Bank】: This jump starter comes with dual USB charging ports. 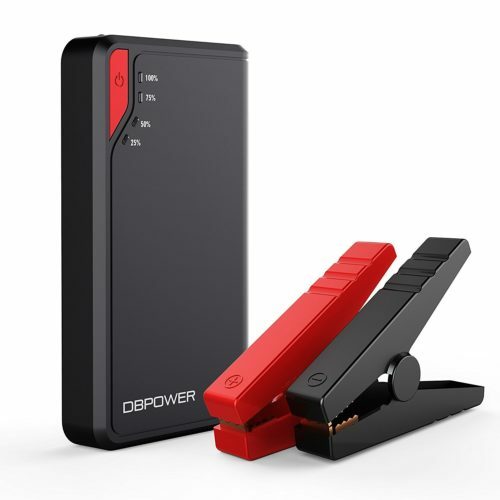 Besides a normal 5V/2.1A USB outputm, it is also equipped with a smart USB output, which can charge compatible devices 4 time faster than normal portable charger. 【Ultimate Safety Protection】: The advanced intelligent protection clamps with a LED screen can provide over-current protection, short circuit protection, over-load protection, over-voltage protection, over-charge protection, etc. to ensure safety. 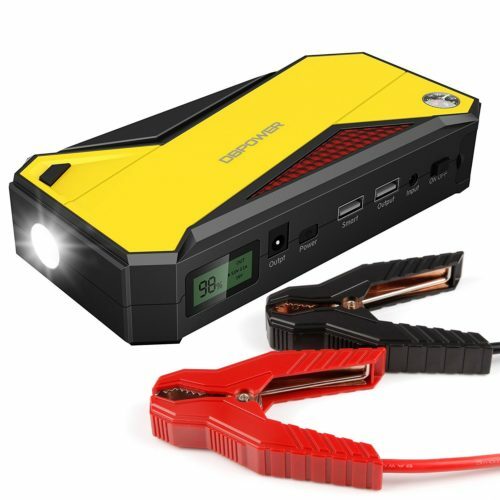 【Compact Size and Light Weight】: This jump starter has a mini size of 6.3*3.2*1.4 inches and light weight of 506g. Easily fits in your glovebox. 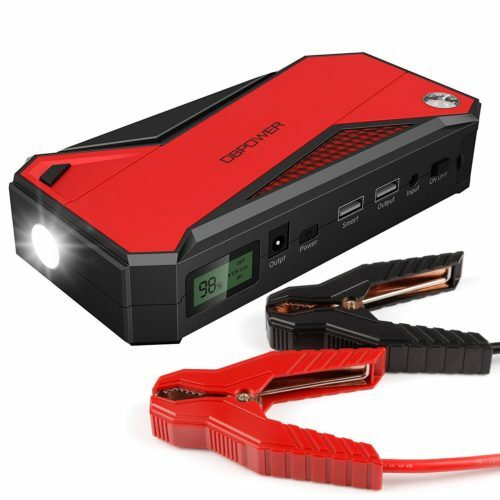 【LED Flashlight and Type-C Port】: This jump starter is designed with a three-mode LED flashlight (lighting, SOS, strobe) and an advanced Type C input/output to be charged or charge other devices. 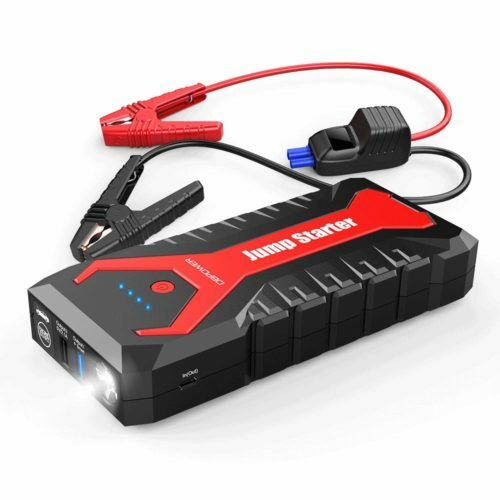 【Powerful Starting Capacity】:This jump starter can provide 2000A peak current to jump start various vehicles (motorcycle, RV, tractor, light-duty trucks, cargo vans, ATVs, snowmobiles, oil boat, etc.) up to 8.0L gas engine or 6.5L diesel engine. 【Ultimate Safety Protection】: The advanced intelligent protection clamps with a LED screen and buzzer can provide over-current protection, short circuit protection, over-load protection, over-voltage protection, over-charge protection, etc. to ensure safety. 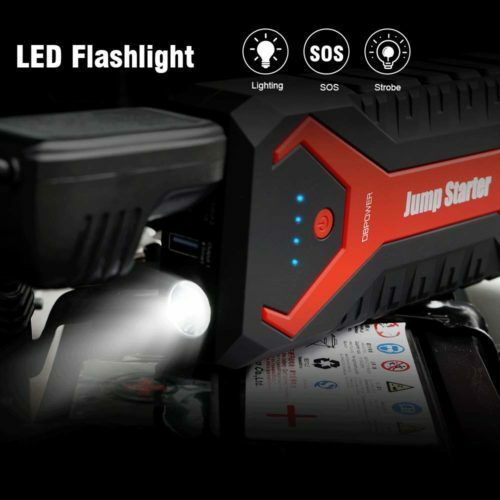 【Compact Size and Light Weight】: This jump starter has a mini size of 7.5*3.4*1.4 inches and light weight of 615g. Easily fits in your glovebox.